This weekend seemed to fly by too fast, but it was a productive weekend. We still have my mom’s dog, Dasher, while she is recovering from hip replacement surgery and he is a, uh, portly dog. 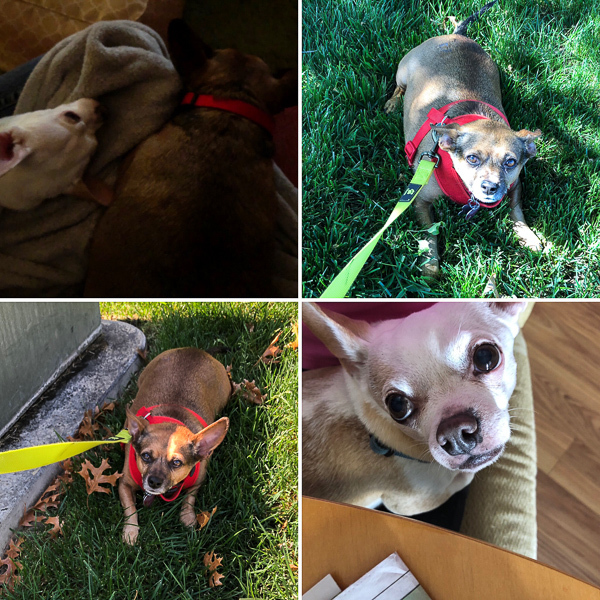 He’s a sweetheart, but could stand to loose a few pounds and gets tired on long walks with Miko having to rest in the grass frequently. It’s also still madness of attention competition between Miko and Dasher, Miko is extra clingy and they fight for my lap while watching TV. 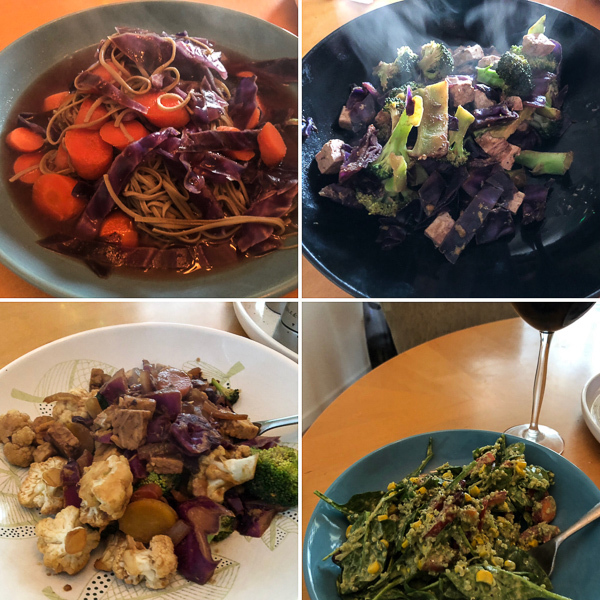 I am still recovering a bit from being sick, having it turn into a sinus infection, and then taking antibiotics for that, my digestive system is still trying to get back to normal and eats have been pretty basic this week with soybean spaghetti miso soup, tofu stir fries, tempeh stir fries, and huge salads. 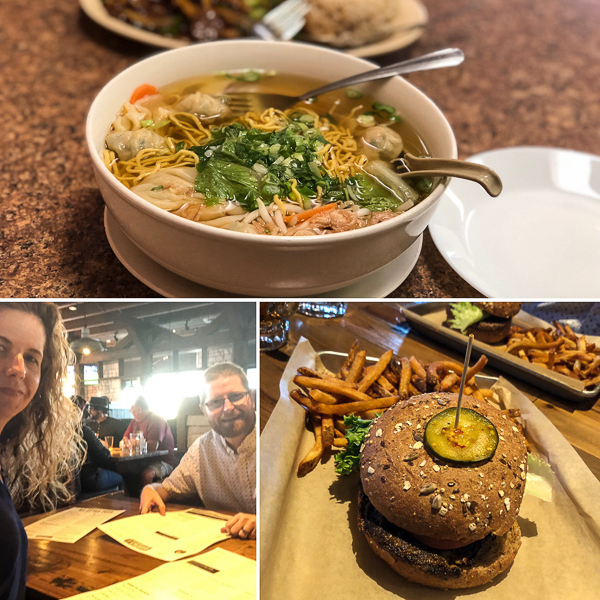 But we went out too for delicious wonton soup from Pho Vegan Asian Cuisine and vegan burgers and fries from Broderick. 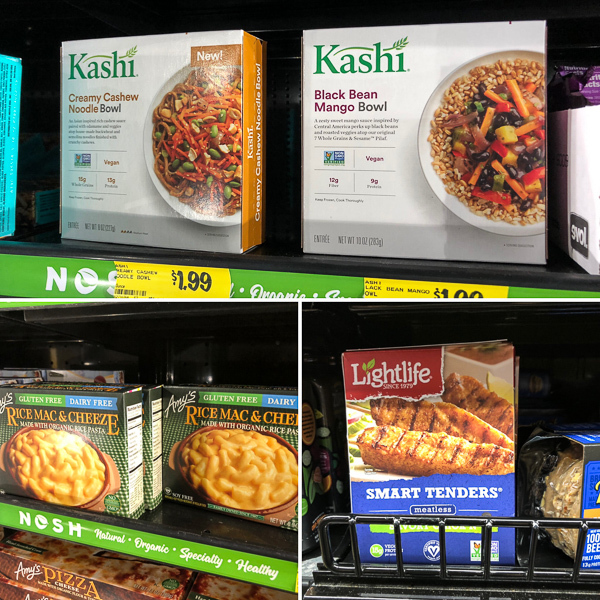 Yesterday I went on a deal hunting trip to Grocery Outlet where I found a nice selection of frozen meals and Lightlife products. 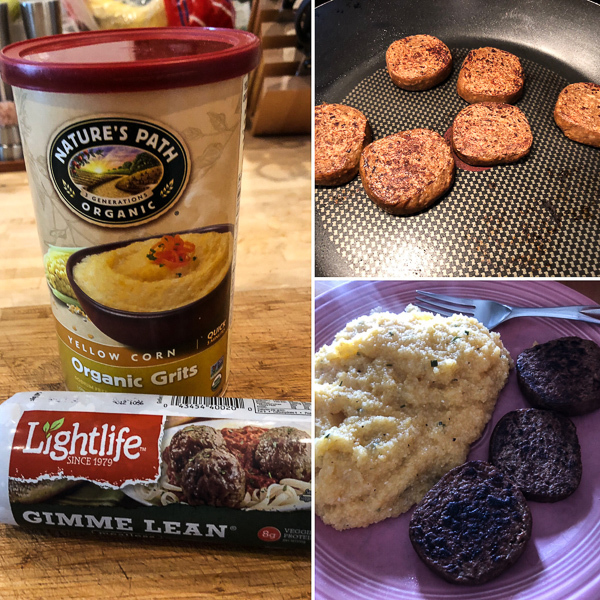 We decided to try the Gimme Lean Vegan Beef served as breakfast sausage with grits this morning for a fun breakfast since I’m trying to get more creative with breakfast on the weekends to break weekday smoothie ruts. The “beef” is only 60 calories per serving, nonfat, and has a nice amount of protein and fiber. 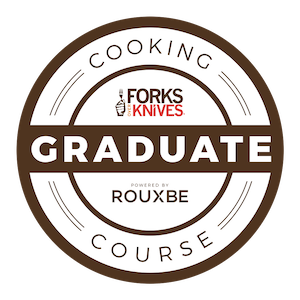 The flavor and texture are great for such good stats, hubby noted it’s like a Salisbury steak and would be great served with vegan gravy too. Worth a try for a much healthier option for breakfast sausage. My mom is doing a lot better recovering from her surgery, less pain and more mobile. The first week after the surgery was rough, so we’re glad things are getting better for her. Hope everyone has a great week and to the list! Elon is making the world more vegan. Why become vegan? The history of meatless eating. Mmmm, vegan nuggets at the movies. This vegan transformed his junk food diet. This seemingly healthy woman transferred high blood pressure. How to avoid injuries as a beginner runner. Former heavy smoker runs first half marathon at 83. It’s never too late for a healthy change. 3 reason to go vegan. What to do with all those damn plastic bags. A lot of people went vegan in 2019. Why this author is an annoying vegan. 15 vegan desserts to impress with. The running boom is here to stay. Love the vegan options at Disney and can’t wait to check them out. Oat milk is the new hotness and I’m all for it. Totally ditto your dog problems! Dasher is pudgy, haha! My moms dog….huge, when she visits, she’s on a strict and healthy diet here! And yes, the competition for a spot on the couch is fierce. Too funny! Haha, guess your mom spoils her dog too! :-) Oh yes, they follow me all over the house racing to the best spots in the room. Good idea for the Gimme Lean. Did you just slice it out of the tub or add other seasonings? I’ve gotten it before but didn’t really know what to do with it. We just sliced it out and browned it on a pan, no extra seasonings and it was great. I think it could make great “meat” balls too or chopped and added to a tofu scramble.